Summary: From the 1st. to 4th. centuries Rome suffered disease and crop failures due to climate change. This occurred once again in 535 C.E shaping the modern world. This paved the way for Islam. Extreme weather events of 535-536 produced severe and protracted short-term episodes of cooling. This was the worst event in the Northern Hemisphere in the last 2,000 years. The event caused by an extensive atmospheric dust veil. Scientists believe a large volcanic eruption in the tropics was the cause. This came at a time Emperor Justinian was reclaiming the Western Empire. He defeated barbarian tribes that overrun the area. In history class when I read this, the subject dropped from the text books. Then I read how Muslim expansion was halted in France. The Battle of Tours (also called the Battle of Poitiers) in 732 was a turning point. But what happened the proceeding 300 years? Or between 540 C.E. to Mohammed in 630 C.E.? I'll answer the question. Let us look at the earlier fall of the Western Empire. What caused so much chaos in the Western Roman Empire from the end of the rule of Marcus Aurelius? From 180 C.E. (Pax Romana) to the "Fall" of the West around 480 C.E.? Better yet, what was it that drove the Germanic tribes of Northern and Central Europe into the Roman West? The answer it seems was climate change. Barabrians such as the Huns drove millions west. Looking at the climate chart above a general cooling trend lasting five centuries. This played havoc on agriculture in much of Europe. Plagues that swept the Empire as a weakened and sick population would be far more vulnerable. Add political corruption and war it was a recipe for ruin. Two massive eruptions Krakatoa (539) and El Salvador (534-5) are likely causes. This opened the door to the bubonic plague. Low temperatures caused drought and famine. It allowed plague bacteria infected fleas to spread the plague. The 535 eruption from historical accounts blocked the sun from March 236 for 18 months. Research posits the plague may have traveled from East Africa on ivory ships. Or from grain ships from Egypt. The plague and famine devastated the Byzantine Roman and Persian Empires. This spared central Arabia. Grain ships carried plague from Britain to the Black Sea. It traveled along the vast and still surviving system of Roman roads. The plague would kill millions and continue to erupt in waves for years. Whole regions declined for decades. By 632 Islam would begin its sweep out of Arabia and destroy Persia and much of the Byzantine Empire. 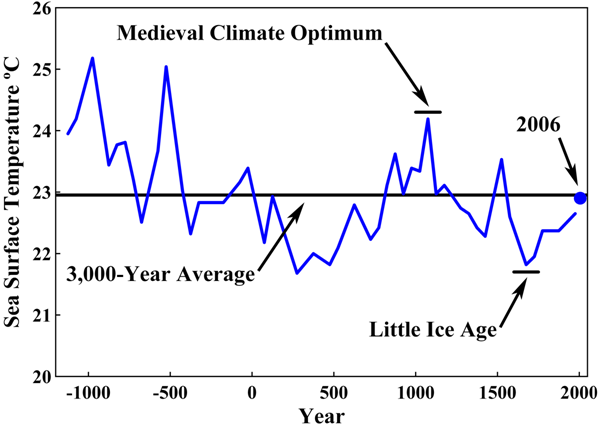 The Medieval Warming Period (900 C.E.) would see Christian Europe recover. They began the counter-attack against Islam. Also knwon as the Crusades. The better climate enabled Europe to recover when farming expanded. The Vikings also would be able settle in Iceland and Greenland. Early victories of the Crusaders halted and turned back Muslim aggression. This lasted 200 years between 1095 and 1291. The Great Drought of 1276-99 signaled more climate destruction. Temperatures dropped again around 1300 C.E. Within 40 years the Black Death would sweep in from Asia. Millions more died. The Vikings would survive in Greenland until about 1300 when a very severe cold period set in. Severe drought and cold ravaged Eastern North America. It killed many of the early English colonists. The following are extracts of answers given by William Rosen author of Justinian's Flea Plague, Empire, and the Birth of Europe His website and ordering information are at www.justiniansflea.com. Q: What were the consequences of the plague of Justinian? The best way I know to answer that is this: Between the end of the 4th century and the beginning of the 6th, the Roman Empire had lost Britain, Spain, France, and Italy to a series of barbarian invasions. Between the years 532 and 540, the empire had reconquered North Africa, southern France, Italy, and Spain, and was a good bet to reestablish itself over almost the entire territory ruled by Augustus. Similarly, in the middle of the fourth century, the Sassanid Persian Empire was at its absolute apex of power and wealth, ruling from Pakistan to the shores of the Black Sea. So, while it would be wrong to say that we know that something as complex as the fall of the Roman Empire was caused by a flea, it is even more wrong to say that we know it wasn't. Or, put another way, hard as it is to say precisely how the pandemic changed the course of history, it is just plain wrong to suggest that subsequent events would have been the same had it not appeared. Q: We've heard a lot recently about the way in which global warming/climate change may result in future epidemics; was there any relation between climate and the Plague of Justinian? A National Academy of Sciences study last year actually showed a relationship between warming and the percentage of rodents that become infected with the plague bacterium, predicting up to a 50% increase in prevalence in places like Central Asia. However, something that depends on as many factors as a plague epidemic is more complicated. The same weather that makes Y. pestis more infective may limit the travel of the fleas that carry them. Case in point: One of the best guesses for the origin of the disease is East Africa; some pretty persuasive research indicates that one of the events that preceded its arrival at the mouth of the Nile in 540 AD was a several years-long worldwide drop in temperature, probably caused either by a comet, or by a massive volcanic eruption...and the change may have caused the flea-carrying rats to migrate north. The lesson of the Plague of Justinian, partly because it depends on such an extraordinarily unlikely - and extraordinarily unhappy - alignment of rats, fleas, and humans moving them around fast enough that they can spread infection before they die themselves, is that small disruptions in ecological equilibrium (what we used to call the balance of nature) can have big consequences. So, while it's too much to say that overall global warming is likely to be the cause of a new outbreak of bubonic plague, it is not something we ought to be sanguine about. Q: What about Islam and Persia? A lot of modern-day Iranians obviously take a great deal of pride in their Persian imperial past...so much so that the movie 300 generated quite a lot of anger on behalf of folks who thought the movie defamed the Persians of Xerxes. In some ways, they are the successors of those empires, but it's also true that when the armies of Islam conquered the Sassanid Persians, as a direct consequence of the events described in Justinian's Flea, they did their level best to destroy everything about all those Persian empires that preceded them; they leveled the Persian's capital city, built Baghdad on the opposite side of the Tigris, remade the language, the calendar, pretty much everything. I suppose it's a testimony to the size of the shadow that the Persian empire cast that it's still visible fifteen centuries after it was destroyed. It started among the Egyptians. Then it moved to Palestine and from there spread over the whole world...In the second year it reached Byzantium in the middle of the spring." He says that for the majority of those stricken the onset of fever was the first sign, and then there developed after a few days a bubonic swelling, either in the groin, in the armpit, or beside the ears. He reports that the mortality rose alarmingly, eventually reaching more than ten thousand each day. Procopius also mentions that the emperor himself was taken ill, but only in his Secret History did he go on to reveal that there were rumors at court that Justinian had died and that speculation about the succession flourished. Justinian, however, recovered and reigned for two more decades. The lawyer Agathias undertook to continue the history of Procopius. He says that after 544 when plague ceased in Constantinople, it had never really stopped but simply moved on from place to place, until it returned to the city almost as though it had been cheated on the first occasion into a needlessly hasty departure. This was the spring of 558, when "a second outbreak of plague swept the capital, destroying a vast number of people." The form the epidemic took was not unlike that of the earlier outbreak. A swelling in the glands in the groin was accompanied by a high fever that raged night and day with unabated intensity and never left its victim until the moment of death. The port of entry for the disease into Gaul in the first place, we can assume, was Marseilles, since the earliest report we have of it in Gaul was in the Rhone Valley. While Gregory did not mention Marseilles in his passage on the outbreak of 543, he has an astonishing tale to tell of the one there in 588, astonishing for the bits of etiological insights it contains. "A ship from Spain put into port with the usual kind of cargo, unfortunately also with it the source of this infection. Quite a few of the townsfolk purchased objects from the cargo and in less than no time a house in which eight people lived was completely deserted, all the inhabitants having caught the disease. At the end of two months the plague burned itself out. The population returned to Marseilles, thinking to be safe. Then the disease started again and all who had come back died. On several occasions later on Marseilles suffered from an epidemic of this sort." It is widely thought to have been an outbreak of bubonic plague caused by the bacterium Yersinia pestis. Usually thought to have started in Central Asia, it had reached the Crimea by 1346 and from there, probably on merchant ships, it spread throughout the Mediterranean and Europe. The Black Death is estimated to have killed 30% to 60% of Europe's population, reducing the world's population from an estimated 450 million to between 350 and 375 million in 1400. This has been seen as creating a series of religious, social and economic upheavals which had profound effects on the course of European history. The second pandemic, well known to all readers of history as the "Black Death," erupted in Central Asia in the 1330s, reached the Crimea by 1346, and then moved on the following year to Constantinople and thence to ports all around the Mediterranean. It spread more widely and moved further inland than it had eight hundred years before, for example, by reaching Scandinavia and also far into the Arabian peninsula for the first time. For more than a century and a half it continued to recur with notable regularity, but then became sporadic, though still deadly, vanishing from Europe in 1772, but lingering in the Near East until the 1830s. This plague too was carried on ships and emerged from seaports that now covered even larger areas.